Kids are amazed to learn how tiny the seeds of many beautiful flowers are. Imagine: all that energy to produce all those stalks, leaves and flowers, from such an eentsy little seed! They also get a charge out of the hide-and-seek process of finding the seeds in the spent flowerheads of the season before. Queen Anne's Lace in the field. 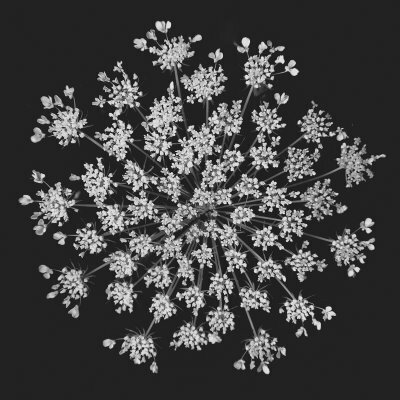 Close-up of a Queen Anne's Lace flowerhead. 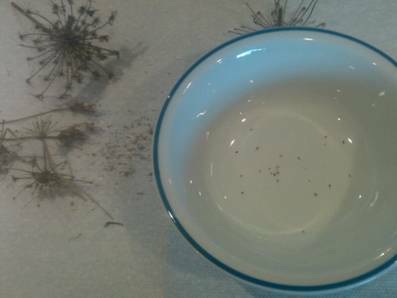 This student counted 22 seeds from one crushed Queen Anne's Lace flowerhead. It's a fun early spring activity to collect wildflower seedheads that bore blossoms last summer, and put them in a paper bag to bring home. If you don't have the wildflowers on your property, then it's OK to walk along a country lane as long as you don't venture onto someone else's property besides public ground. Or if you want to, just ask first! And remember: never take more than about 10% of the flowerheads you see. You don't want to disturb the balance. Then, working inside - out of the wind! -- over a plain white paper towel or a napkin, kids can crush each head, and look at the chaff that falls to the white surface. They will notice that there are a number of little "spots" that look the same. Eureka! Those are the SEEDS! They can carefully collect and count their bounty, and soak and start some of them, and trade or give away the rest. It's best to keep seeds in small paper bags, or insert moisture-retaining desiccant packets. They come with new shoes, or you can purchase them in garden stores or online. Store seeds in labeled plastic zip-lock bags or rigid containers.